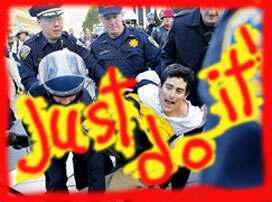 Civil Disobedience is the act of disobeying a law on grounds of moral or political principle. It is an attempt to influence society to accept a dissenting point of view. Although it usually uses tactics of nonviolence, it is more than mere passive resistance since it often takes active forms such as illegal street demonstrations or peaceful occupations of premises. The classic treatise on this topic is Henry David Thoreau's "On the Duty of Civil Disobedience," which states that when a person's conscience and the laws clash, that person must follow his or her conscience. The stress on personal conscience and on the need to act now rather than to wait for legal change are recurring elements in civil disobedience movements. The U.S. Bill of Rights asserts that the authority of a government is derived from the consent of the governed, and whenever any form of government becomes destructive, it is the right and duty of the people to alter or abolish it. 1) The Boston Tea Party -- citizens of the colony of Massachusetts trespassed on a British ship and threw its cargo (tea from England) overboard, rather than be forced to pay taxes without representation to Britain. This was one of the many acts of civil disobedience leading to the War for Independence, establishing the United States of America as a sovereign state. 2) Anti-war movements have been a part of U.S. history since Thoreau went to jail for refusing to participate in the U.S. war against Mexico in 1849. More recent examples were the nationwide protests against the war in Viet Nam, U.S. involvement in Nicaragua and Central America, and the Gulf War. Actions have included refusal to pay for war, refusal to enlist in the military, occupation of draft centers, sit-ins, blockades, peace camps, and refusal to allow military recruiters on high school and college campuses. 3) The Women's Suffrage Movement lasted from 1848 until 1920, when thousands of courageous women marched in the streets, endured hunger strikes, and submitted to arrest and jail in order to gain the right to vote. 4) Abolition of slavery -- including Harriet Tubman's underground railway, giving sanctuary, and other actions which helped to end slavery. 5) The introduction of labor laws and unions. Sit-down strikes organized by the IWW, and CIO free speech confrontations led to the eradication of child labor and improved working conditions, established the 40-hour work week and improved job security and benefits. 6) The Civil Rights Movement, led by Martin Luther King, Jr. and others, included sit-ins and illegal marches which weakened segregation in the south. 7) The Anti-Nuclear Movement, stimulated by people like Karen Silkwood and the Three Mile Island nuclear power accident, organized citizens throughout the country into direct action affinity groups, with consensus decision making and Gandhian nonviolence as its core. Massive acts of civil disobedience took place at nuclear power facilities across the country, followed by worldwide protests against first-strike nuclear weapons, occupying military bases, maintaining peace camps, interfering with manufacture and transport of nuclear bombs and devices, marching, sitting in, blockading and otherwise disrupting business as usual at nuclear sites. 8) Environmental and forest demonstrations, with acts of civil disobedience such as sit-ins, blockades, tree sits and forest occupations, have emerged in the last decade, prompted by the continuing mass clear cuts and destruction of the forest ecosystem and widespread environmental consequences. In all of these struggles, citizens had reached the conclusion that the legal means for addressing their concerns had not worked. They had tried petitioning, lobbying, writing letters, going to court, voting for candidates that represented their interests, legal protest, and still their views were ignored. In each of these movements, the protesters were compelled by deep moral convictions. Their distress was strong enough to motivate them to go against the grain, to sacrifice personal comfort, to face unknown danger, to give up their freedom and risk going to jail. Their love of truth and justice drove them to action. Many, but not all, of those committing civil disobedience in the last two decades have been trained in Gandhian nonviolence philosophy and tactics. Non-Cooperation is used by some protesters during civil disobedience actions. Non-cooperation may include going limp, refusal to give information at booking, fasting and refusal to particpate in court proceedings. Gandhi, who profoundly influenced nonviolent disobedience movements in the 20th century, stated that "Non-cooperation with evil is as much a duty as cooperation with good." Non-cooperation is not intended as a hostile act against police officers and jail guards. An understood theoretical basis is that nonviolent protest draws its strength from open confrontation and non-cooperation, i.e., civil disobedience. We retain as much power as we refuse to relinquish to the government. Non-cooperation is a form of resistance that is used to reaffirm our position that we are not criminals and that we are taking positive steps toward freeing the world of oppression and environmental suicide. The decision to non-cooperate is a difficult choice to make, since it subjects those who choose it to greater possibilities for pain and punishment, and many times is misunderstood by law enforcement. In addition, it poses a dilemma for protesters who would prefer to communicate with the arresting officer, making it more difficult to communicate while being dragged across the ground. 1) Moral conviction: It would be wrong to be an accomplice to a procedure that supports what is morally unacceptable. 2) To increase the likelihood that all protesters are treated equally: Refusing to give names so that everyone committing the same act will be treated equally and fairly in jail and in sentencing. Refusing citation, bail, fines or probation keeps protesters together, increasing the potential for collective bargaining. 3) To extend the action: Going limp at arrest impedes the removal of the protesters, prolonging the disruption of business as usual. 4) To demonstrate that the criminal justice system is part of the problem: It may be a corporation that is damaging the environment, jeopardizing all our lives and our children's future, but it is the criminal justice system that is legitimizing and supporting it. Civil disobedience is often an effective means of changing laws and protecting liberties. It also embodies an important moral concept that there are times when law and justice do not coincide and that to obey the law at such times can be an abdication of ethical responsibility. The choice of civil disobedience and non-cooperation is not for everyone. We all choose to do what feels right to us personally. However, it is hoped that this article will make such a choice more understandable to those who have wondered about this form of protest.